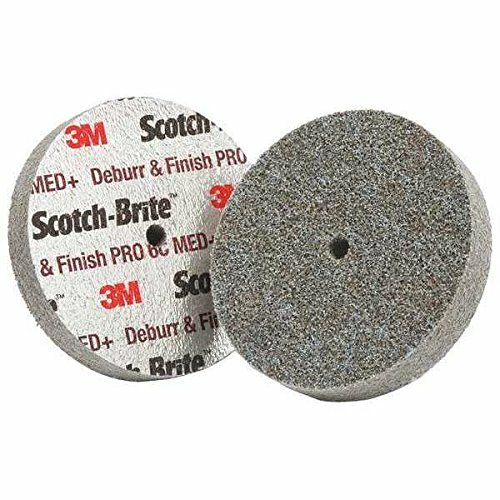 3M Scotch-Brite DP-UW unitized deburr and finish pro deburring wheel uses ceramic as the abrasive material and has a diameter of 3 in. The arbor attachment allows for easy mounting to the tool or pad. In addition to the other aspects of these parts, another important component of these is the thickness. This 3M part is 3/4 in thick. All abrasive products that rotate or spin, such as the ones in this category, have a maximum speed at which you can run them. This 3M deburr and finish pro deburring wheel can be run at a maximum speed of 15100 RPMs. View More In Abrasive Dressing Tools.